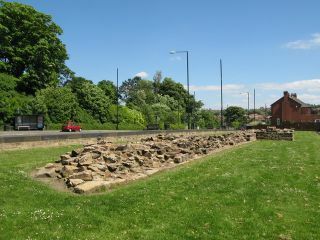 Denton Turret is the partial remains of a turret and an associated length of Hadrian's Wall. The turret is also known as Turret 7b. It is almost square, measuring 13 feet by 14 feet. Excavation has revealed a platform inside the turret, which is set into the wall to a depth of 5 feet. Denton Turret is thought to have been in use on 3 separate occasions. The first was directly after the building of the Wall, from 122-196 AD. The second period of occupation was from 205-295, and the third from 300-367 AD. Beside the turret is a section of 'broad wall' measuring 65 metres in length. Denton Turret is located directly beside Denton Hall (otherwise known as Bishops House). Location: Open access site. Located on the A69 4 miles west of Newcastle city centre. Photo Credit: Mike Quinn, licensed for reuse under the Creative Commons Licence.